I am putting the finishing touches on my first on-line journaling class Dream Journals and boy would I like to see you there. 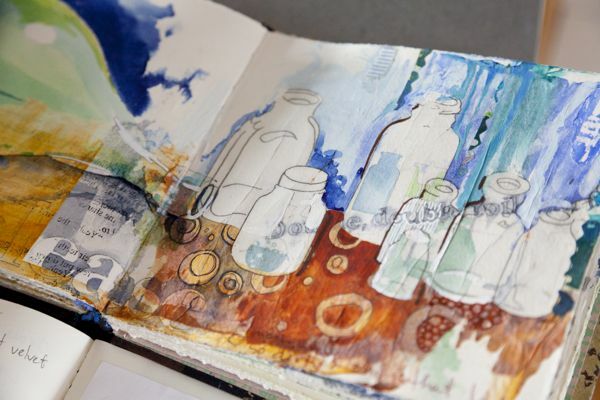 We will learn to use watercolors, resists, we’ll draw, paint, play and create journal pages that are richly layered and dynamic. All techniques covered in the class are taught in my book, Dreaming from the Journal Page, but that isn’t a required purchase. I do hope you might though! The class stands alone, but also compliments and expands upon what is contained in the pages of the book. And beside that, we will be working in community with one another, helping and encouraging one another as we go. The daffodil above, is an example of dry on dry watercolor painting, which is covered in two long videos (so far there are over 12 videos in all, more to come). Arrow to the left demonstrates the use of frisket as a resist. I will get you layering, building, drawing, painting and making pretty pages, using easily approachable techniques, in no time flat. I will get you drawing with fun and memorable warm up techniques, and if you have ever been heard to say, “I can’t draw”, you’ll prove yourself wrong. And in order to get the word out about this new class offering, I would like to give away at least one spot in the class. 1. Simply comment on this post to put your name in the hat. 2. To double your chances of winning, link to this post on your blog, Facebook, Pinterest, or your favorite social networking site. BUT, you will need to come back here and leave a second comment with a link to your post, for a total of two comments in your name. You are responsible for this (please don’t link to me on Facebook, as I won’t be able to keep track of that, the comments here are the easiest way from me to keep it simple) . So please help me get the word out, will you? I will announce a winner one week from today, July 10, so please check back. Thanks a bunch. Hey Melanie…… thank you for offering this give-a way! I have Inspired to Quilt and love it. This online class sounds amazing. I am going to go share on my Facebook too(my link is https://www.facebook.com/sandy.meegan. Sounds like a wonderful opportunity! Ooh– I’d love to win this! I’ve been a faithful follower of your for years. I’d love to learn some of your techniques. Thanks so much! The class sounds awesome. i would love to win!!!!!!! Love your book Melanie! the thought of having videos to go with the lessons… WOW! Thanks for generously giving us a chance at a space! Melly…Your class is in my September budget – what a thrill it would be to win the opportunity to take it! Your book is full of wonderful ideas and I look forward to exploring them with y o as my mentor/teacher. Thank you for such a wonderful giveaway! I would love to win and finally get myself moving forward with drawing and journaling. It would be awesome to win this class. I’m loving your Dreaming book. How fun it would be to take your class as well! Such a great opportunity!!! I have really enjoyed your book!! 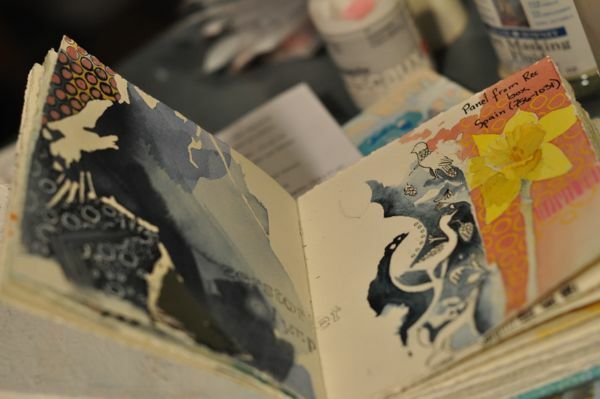 “Layering, building, drawing, painting and making pretty pages”–this sounds like BIG FUN and just what I need! I’ll post a link on FB. Good luck to everyone (okay, especially to me–ha)! I am a fiber artist ,painter and quilter and I would love to try your online class! Oh boy would I like to take this class and have your book in my greedy little hands! I have the book and the supplies. I need the inspiration and the kick in the pants. I’m in. I have the first book and this would be lots of fun. I would love to take your class! Thanks for this oppty, Melly. I have your book already, just don’t know where to begin because *I can’t draw*! So I’d love to be in your class. Thank you for considering a place for one of us in your class. It looks all so inspiring! So I take a chance. Would love to win a spot in your class!!!! Thanks for the opportunity!!! Oh I would love a spot in your class! I’ve never participated in an oline class before – but this one sounds really tempting! Your book is gorgeous and your class sure to be wonderful. I just posted your link in facebook – it’s German, but I figure there’s no harm done spreading the word in Germany, too! I have yet to try an online class, and I think yours would be a fantastic place to start. My sketchbook could use some love too, so I’d be a happy camper with this opportunity. Here’s the link I think! Internet confuses me…but I try. Would love to take Melanie’s class! Mellie…I just posted a comment on Facebook: Kristin Anne Freeman Thanks Mellie! I would love to win a class with you, that’s for sure. What a cool opportunity to study with a friend. There is nothing better that immersing in art and traveling to worlds undiscovered. I would LOVE to do a workshop with you. So inspiring! Whether I win or not, I’m happy to spread the word! Your work and your spirit are inspirational. thanks for this opportunity. love your work and your books!! Oh!!! I’ve been waiting for this class! I love your book!!! Thanks Melanie! Looks like a very interesting class. Thanks for the chance to win. This sounds very interesting indeed! I would love to win a spot in your class! Hello Melanie! It would be a dream come true to win a place in your workshop! You are the most inspiring artist and person. I will link to this site on my blog! Hello again! I have linked to your on-line course and to your book! I’ve always admired your journaling, but don’t feel i’ve got much artistic ability….would love to take the class, but could you give me an idea of the level of talent needed? Hi, I would like to win this class, it should be a lot of fun. Hi Mellie!! I’d love to win that class. It might force me to take a break from work!! Thanks for the chance!! wow, I am in some great company here, trying to get your class ! This looks awesome. Good luck to all!!!! I would love to win this class with you. I’m retiring soon so I will finally have the chance to play, play, play! My copy of your book hasn’t arrived yet but I can’t wait to see it! I shared your post on Facebook. I’m happy to get the word out about what I am sure is a fantastic class. Would really love to convert myself from ‘can’t-draw’ to ‘can-draw’ in your class. Looking forward to the lucky opportunity! Thanks. would love to learn watercolour techniques – wonderful pages shown here. This sounds like so much fun! I’ll definitely be sharing with other artists that I know! Posted a link on Facebook calling all artists and those who would like to get started in watercolor! What a fabulous opportunity. However, I’d like to vote Kath Walls for the place as I know she’d love this. I will be there in the front row, book in hand, bright-eyed and bushy-tailed! Memememememe…ha! Pick me! Seriously, thanks for the chance! I would love to take your class! Stay cool in this heat! I would love to take this class–I’m hoping to release my creativity, and although it seems counterintuitive, I could use some guidance! With 2 kids 5 and under, some days I just need someone elseo to help me with a little push. Melly, I need this class to get me going. What an honor it would be to take a class with Melly Testa! I’m looking into signing up now. Love your work Mel, and the inspiration you are to all! Wow, your class looks wonderful. I could use something like this. Will post it and share on Facebook and Pinterest, but I am not sure I will be able to show you with a link. But I will try. Here it is on Pinterest. Will post on Facebook too. the book is on my list and I would love to have a spot in your new class. thanks for giving so much of your time. I’d LOVE to win a place in your class! Wow! This will be so much fun– I’m really, really excited. 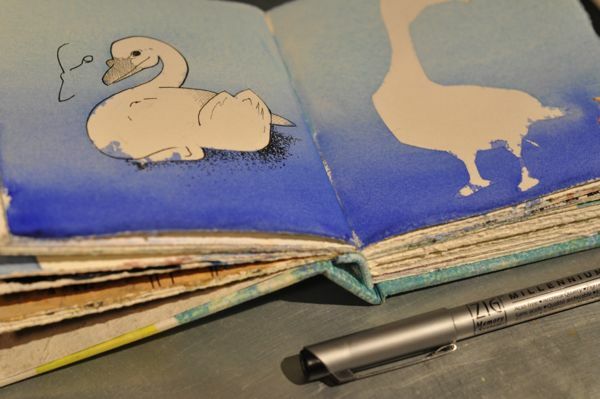 Ok, I do get excited easily, but to learn more techniques like those in “Dreaming from the Journal Page”? Woot!!! Man! I would LOVE to win this giveaway. I have the book and it is my favorite thing I’ve purchased all year! Here’s the link to my fb page! WOW! I would just love to win. Am jealous already of the winner! I really, really hope I win – thanks, Melanie! I have your book and I took your on-line classes with Joggles. I’m really looking forward to another class with you! I’ve added your link to my facebook page. Thanks Mellie! I just bought you book from Amazon – I can’t wait for it to arrive. Lovely site, and your course looks interesting as well. I have always loved your work, and would be so pumped to win your online class!!!! I would love to take this class-the previous online class I took from you, I still look back at my notes. You are appreciated! It was a great class and I use my hand dyed floss at night ,hand stitching slowly away to relax. I’ve asked for your book for my birthday and to be able to do the online class as well would be the ‘icing on the cake’. Thanks for your generosity in offering this. How exciting! I’d love to take your class, taking it for free would be wonderful too, thanks for the chance. It would be wonderful to take your class. I’ve already your book! Hey Melanie, what a cool class this will be! If I don’t join the first round, I’ll try to do it later. For some reason, I feel like doing fiber stuff while I’m doing chemo. Go figure. The book looks FAB!!!! I have wanted to start a journal for years but never quite took the plunge. I’m ready! Sounds like a fabulous class and a wonderful prize. Thank you for this opportunity. My copy of Dreaming From The journal page arrived today. What a great book. I am going to work through it page by wonderful page! The online class will be fabulous. I would so love to be in your class! I would so love to win! I just received your book in the mail but haven’t taken the time to do my “Dreaming”. It would be so much fun to work along with you while reading your book! Thanks for the chance to win! Winning this class would give me the jumpstart I need to do more journaling! glad I saw the facebook post to remind me to enter for the class! I would come out to play with bells on. Sewing bags like crazy around here, didn’t stop at just a bag for my sewplies! Love you! I am sending positive vibes out into the universe! Hi Melanie! I would love to win but if not I plan to take a class with you. I need to fill up my sketchbooks. Sounds wonderful! Congrats on this new book! I have read your book cover to cover. Love your style. I have been wondering how you are doing physically now? Thanks for the opportunity to glean from you. I will be praying for you. I love the book and would love a spot in class !! I preordered your book and when I got it, I was so excited! It is AWESOME! I’ve been following you for sometime, through your health ups and downs, etc., and watched your bravery and creativity throughout all. I would so love to win the opportunity to take this course. I know it will be amazing! This looks like another great book from you! Can’t wait to get my hands on a copy & possibly take the class!! Thank you for doing & sharing. I posted to my FB pg the URL to this page. Hey I’d love to take a class with you! I will share your page on FB too! …by th way… I miss you!! !